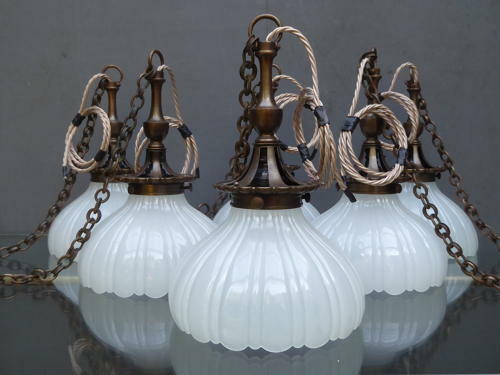 A run of original antique Jefferson Moonstone glass pendant lights. A stunning run of pendant lights with fluted opaque glass shades & the most amazing original galleries in cast bronze, all with their original hanging chains & ceiling roses. Jefferson pendant lights are noted for their robust nature yet wonderful delicate appearance & the opaque pressed glass emits a beautiful glow once lit. Simply stunning & a real rarity in this superb & complete original condition. Six available, priced per light. Wear commensurate with age, fantastic condition throughout with a little standard nibbling around the tops which is in all cases hidden from view by the galleries & some historic light abrasive marks to the ceiling roses. Measurements above refer to the shades & galleries only, the lights have a drop of around 81cm with the chain which can easily be shortened. UK courier service available at £13 per light tracked & signed for 24 hour delivery (I usually ship these separately or in pairs in order to ensure they arrive damage free).